Yesterday, I returned from a deeply meditative week along the Plattekill waterfall. 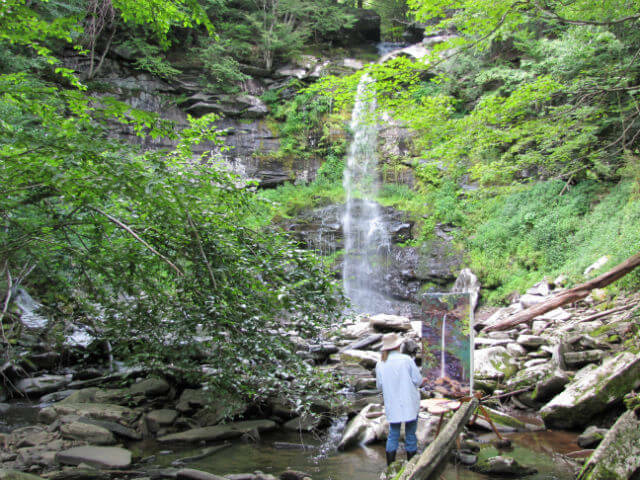 This artist-in-residence program, sponsored by the Catskill Center for Conservation, entails a small, simple, rustic cabin at the top of an 80′ waterfall in the Platte Clove. A clove is a Dutch word for an incredible deep cut in the mountains, so deep it conveys a feeling of an abyss. Through these deep cuts flow many incredible waterfalls- the majestic Kaaterskill falls, as well as the Plattekill falls flow out of the escarpment and into the Hudson River. The sublime beauty of this landscape attracted many painters of the 19th century including Frederic Edwin Church, the author and inspiration of the Hudson River School of painters. It was a great privilege to be a part of this history. 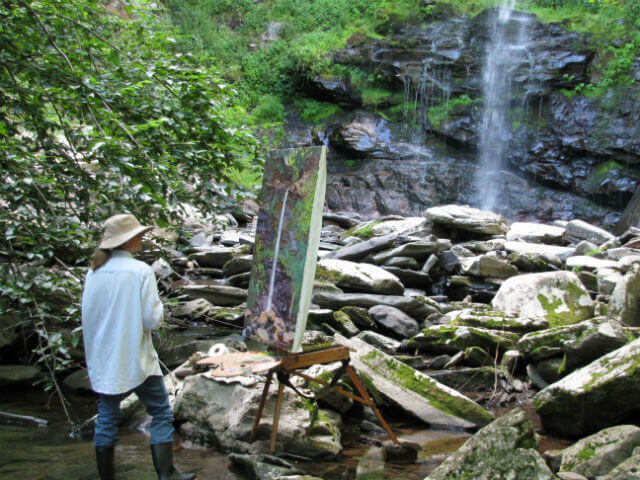 Although I have painted at these falls in the past, I never had enough compressed time to really work on a serious piece that would describe the proper scale of the waterfall. When one looks at such a large waterfall, it is so difficult to conceive of its true size. Achieving a sense of scale is imperative to conveying the magnitude and therefore the sublimity of the space. Working on a larger scale, a scale that freely describes the elegant length of this single stream of falling water, enabled me to capture its true magnitude. One always approaches a new painting with certain desires. My hope was that this image would convey an intimacy and grandeur, not only in the realm of nature, but also act as a mirror reflecting the depth and sublimity of soul- a glimpse into its inherent solitude touching upon what remains inexpressible, beautiful and hidden from our everyday perceptions. Although, the falls are ever-flowing without ceasing, there is a sense that time stands still- a feeling for the infinite. With this openness toward the image and its potential for expression, I began. The first day when I arrived at the cabin, I hiked down the deep ravine to plan my image. Since I had been there before, I had a sense of what I wished to do. I wanted to paint the falls in the late afternoon as the sun was waning on the far side of the cliff. This back lit the upper portion of the falls, outlining the large rock formations at the top as well as capturing the late light coming through the trees. It also put the deep gulf of the falls into shadow- not a deep shadow, since there was plenty of reflections on the wet rocks of the blue dome of the sky. But it conveyed a feeling of depth to the plunge. I also was interested in giving the space a grand but intimate feel. Last year, some trees had fallen from one of the overhanging cliffs during the winter and I wanted to incorporate these beech trees on the left of the composition. There was also a extremely large Maple on the right side- light and airy hung its leaves. These two trees, that I would have to peer around to some degree to paint the image, I hoped would give that feeling of intimacy to the composition (glimpsing around something in the foreground is a very Japanese technique made popular by the 19th century, Hokusai). Lastly, I wanted to have an idea of the color chords I would use. 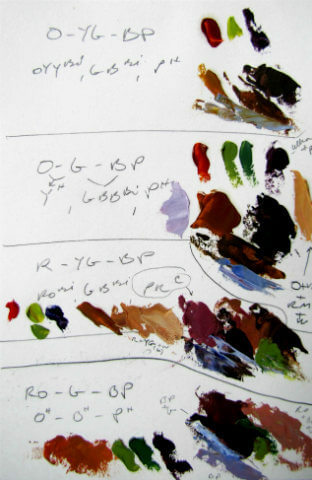 What combinations of color would convey the most refreshing and accurate sense of the light. So I did a quick color sketch that I meditated on in the evening. Beginning such a large landscape on sight is a little intimidating. Such a massive whiteness amid the rich color of the natural world gives one pause- as one can see from the photos of the process. So I tried to plunge right in. When laying in a canvas there is one thing I always try to do, especially on a large canvas- it is what I call “finding the key”. It is a term I use to initially work a small area within the framework of the canvas that gives me the value range as well as the color and contrast that is necessary to bring off the image. I also wish it to convey an initial sense of the inherent emotion in the image. I usually choose an area near the point of focus as this area must contain all of these attributes. Whereas, objects that move away from the central point of focus will contain less contrast, looser edges and less intense color. Once I have a handle on this, which is crucial, I have a key to base my lay-in on. The lay-in takes a lot of time and one must have patience and not rush through the process trying to cover the white, empty canvas so one can see the proper relationships. Although, I worked over 4 hours the first day, I was not able to completely cover the canvas. It took two days and over 9 hours to do it. But if this lay-in is solid, the painting is clearly mapped out and the subsequent days are all about refining the image and conveying its emotional tone. For me, the last day, the last brushstroke is the most difficult. I always seem to reach a point where I could almost begin the painting again. It is a place in which the moment I have tried to convey is passing and the next moment or scene, as in a play, has approached. Then it is time to stop, reluctant though I am to end such an experience. This deep and heightened state of consciousness, I desire to hold aloft and suspended- eternally. When one has found, symbolically, an image that penetrates beyond the mere appearance of things one wants to hold it and re-experience its beauty and dynamism again and again. But we are time bound and eventually our mind and spirit cannot contain its essence any longer and we must let go. The artist moves between these heightened moments, always at a loss, wandering in the in-between. He lives and yearns for the heights, an intimate and profound experience of the world. It is paramount to “living”. All other time is but a “nostalgia” for this moment to return. Judith, It is exciting and inspiring to read your discription of creating this masterpeice especelly after seeing and reading about your past paintings of this waterfall. I would love to see the painting. It looks magnificent in the photos. The video is a great idea. Enjoy watching it. Thanks for sharing this and all your posts.